Some people with severe mental health problems often also deal with physical health issues (Osborn, 2001) and can face issues with social isolation (Brophy & Harvey, 2011; Wang et al., 2016). These factors can in return of course negatively impact on the mental well-being and aggravate and deepen mental health related problems. Many adjunct interventions for people with mental ill health therefore try to target these difficulties by fostering physical well-being and social inclusion. Naturally, physical exercise interventions that use team sports bear a great potential to increase physical health and connectedness. Due to its massive popularity across a range of cultural and socio-economic groups, football seems particularly apt to motivate people to engage in physical activity and to tackle isolation. Studies have shown that the nature of exercise in football is effective in increasing cardio-vascular health for example (Oja et al., 2015) – an issue that is often reported in people with mental health problems (Osborn, 2001). It is therefore unsurprising that football intervention as a form of adjunct treatment form for people with mental health problems has grown in popularity over the past years. In a recent review, we have summarised the existing evidence from peer review literature on the effectiveness of football interventions for people with mental ill health (Friedrich & Mason, 2017b). Most studies used qualitative methods like interviews, focus groups and ethnography approaches while some research projects looked into quantitative questionnaire data. Due to the heterogeneity of the methods and outcomes it is hard to summarise all findings, but the general story seems to be that that football did help foster social connectedness in this population (see for example Brawn, Combes, & Ellis, 2015; McElroy, Evans, & Pringle, 2008), increased emotional well-being (e.g. Butterly, Adams, Brown, & Golby, 2006; Steckley, 2005) as well as different aspects of physical health (for example Carless & Douglas, 2008; Henderson, O’Hara, Thornicroft, & Webber, 2014). 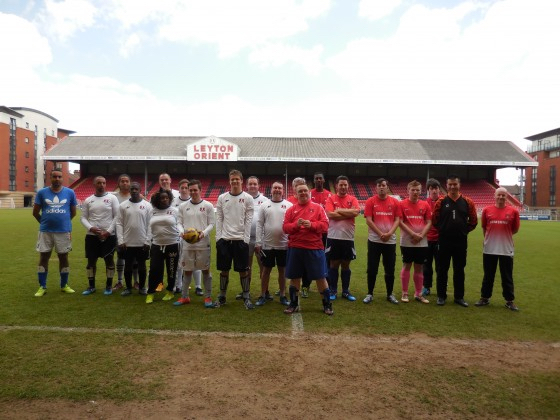 The London based project, Coping Through Football (CTF), is an intervention delivered in a collaboration between the London Playing Fields Foundation, the Northeast London NHS Foundation Trust (NELFT) and Leyton Orient. Operating since 2007 in the North East of London, it offers informal football sessions on two days of the week for people who are referred from primary and secondary health care providers for mental health problems. Occupational Therapists (OTs) attend the sessions to support participants, monitor in semi-annual assessments physical and emotional well-being as well as other progress (e.g. professional development), and help the coaches to facilitate the sessions. In addition to this, occasional healthy living workshops are organised to inform participants about issues such as health eating, weight loss and smoking cessation. In a first evaluation in 2012, Mason and Holt conducted qualitative interviews with participants, referrers and coaches to identify themes of their experience of CTF and its impact on their recovery. The results show that participants felt empowered and reported a sense of enjoyment that came from their participation in CTF. Furthermore, they reported that taking part in the football intervention helped them reconnect to their former self. Also being in an environment that made them feel safe helped them to open up again to the social world and to thereby tackle a sense of isolation. The project has expanded since 2012 and is now delivered in the four London boroughs covered by NELFT. We conducted a quantitative analysis of the routine assessment data for those with consecutive assessments that included one at inception to CTF (Friedrich & Mason, 2017). We found that self-esteem and perceived quality of life significantly improved at 6 month follow up but the improvements were not significant in the 12-month comparison. Physical activity however (both vigorous and moderate) improved for both follow up points. Furthermore, we conducted a content analysis of the statements participated made in their regular clinical assessment when asked what they would describe as their main life improvement as a consequence of their participation of Coping Through Football. In this analysis we used categories derived from Seligman’s PERMA model (Seligman, 2011) to see whether the intervention improved participants well-being in the sense of the Positive Psychology approach. Indeed, we found that participants’ statements on life improvements could be assigned to most of the categories of the PERMA model: participants reported an increase in positive emotions, a sense of engagement, positive relationship experiences, and a sense of achievement. These factors speak in favour of this intervention having approved well-being as defined in Seligman’s positive psychology approach. We have recently conducted interviews with 30 participants and 5 stakeholders to gain further insights into themes of recovery and to better understand the mechanisms in which the intervention impacts on the participants. The respective outcomes (in preparation) seem to generally confirm findings from the evaluation 6 years ago. The accounts of the participants reflected improvements with regard to their emotional and/or physical well-being. The strongest theme by far was the relationship experience, i.e. feeling being part of a group/team and its positive effects on battling potential feelings of social isolation. Interestingly, the participants ‘roads to recovery’ seem very individual, strongly depending on their individual needs and their personal motivation what to get out of the intervention. The issues that participants mentioned in the interviews as factors that interfering with a positive/ effective experience centred around conflicts between players on the pitch, the proper integration of women in the game and the group (mainly reported by the women) and the difference in level of play and fitness. Our findings from the literature review and our own evaluation highlight the potential of football interventions as an adjunct treatment form for people with mental health problems which can be beneficial to improving mental and physical well-being and that can help people tackling social isolation. One crucial ingredient for success of such interventions seems to be using a ‘person centred approach’, i.e. taking into account the individual’s abilities, needs and personal goals. Furthermore, it seems key that staff are emotionally supportive and are willing to react efficiently to participants’ concerns and problems that are brought to their attention. The formation of women only and men only teams might be considered if feasible (and wished) to avoid issues around the integration of women in groups that mainly consist of male players. The work described here was conducted by Dr Oliver Mason and Dr Bettina Friedrich (http://sphr.nihr.ac.uk/football-effective-mental-health-intervention-evaluation-coping-football/). This research was funded by the NIHR School for Public Health Research (SPHR) Public Health Practice Evaluation Scheme (PHPES). The views expressed are those of the author(s) and not necessarily those of the NHS, the NIHR or the Department of Health. The NIHR School for Public Health Research (SPHR) is a partnership between the Universities of Sheffield, Bristol, Cambridge, Imperial College London, UCL; The London School for Hygiene and Tropical Medicine; the LiLaC collaboration between the Universities of Liverpool and Lancaster and Fuse; The Centre for Translational Research in Public Health, a collaboration between Newcastle, Durham, Northumbria, Sunderland and Teesside Universities. Brawn, P., Combes, H., & Ellis, N. (2015). Football Narratives: Recovery and Mental Health. The Journal of New Writing in Health and Social Care, 2(1), 30-46. Brophy, L., & Harvey, C. (2011). Social isolation in people with mental illness. Medicine Today, 12(10), 73-78. Butterly, R., Adams, D., Brown, A., & Golby, J. (2006). Client perceptions of the MUSCSEL project: a community-based physical activity programme for patients with mental health problems. Journal of Public Mental Health, 5(4), 45-52. Carless, D., & Douglas, K. (2008). The role of sport and exercise in recovery from serious mental illness: two case studies. International journal of men’s health, 7(2), 137-156. Friedrich, B., & Mason, O. (2017). Evaluation of the Coping Through Football project: physical activity and psychosocial outcomes The Open Public Health Journal. Friedrich, B., & Mason, O. (2017). “What is the score?” A review of football-based public mental health interventions. Journal of Public Mental Health, 16(4), 144-158. Henderson, C., O’Hara, S., Thornicroft, G., & Webber, M. (2014). Corporate social responsibility and mental health: The Premier League football Imagine Your Goals programme. International review of psychiatry, 26(4), 460-466. Mason, O. J., & Holt, R. (2012). A role for football in mental health: the Coping Through Football project. The Psychiatrist, 36(8), 290-293. McElroy, P., Evans, P., & Pringle, A. (2008). Sick as a parrot or over the moon: an evaluation of the impact of playing regular matches in a football league on mental health service users. Practice Development in Health Care, 7(1), 40-48. Oja, P., Titze, S., Kokko, S., Kujala, U. M., Heinonen, A., Kelly, P., . . . Foster, C. (2015). Health benefits of different sport disciplines for adults: systematic review of observational and intervention studies with meta-analysis. British journal of sports medicine, 1-8. Osborn, D. P. (2001). Topics in review: the poor physical health of people with mental illness. Western Journal of Medicine, 175(5), 329. Seligman, M. E. P. (2011). Flourish: A Visionary New Understanding of Happiness and Well-being: Atria Books. Steckley, L. (2005). Just a game? The therapeutic potential of football Facing forward: residential child care in the 21st century (pp. 137-147): Russell House Publishing. Wang, J., Lloyd-Ewans, B. R., Giacco, D., Forsyth, R., Nebo, C., Mann, F., & Johnson, S. (2016). Social isolation in mental health. Next In Denmark, Football Fitness is the new girl in the FA school of football – but who is she?